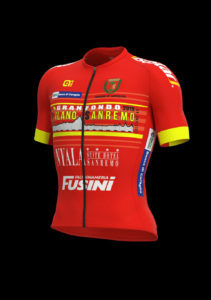 For all those who arrange their registration by 30 April, a souvenir T-shirt of the Milan – San Remo Granfondo Cicloturistica will be included in the race pack. In view of the time needed for production, it will not be possible for you to receive the souvenir T-shirt even if the order is processed within the expiry date, but the payment is received too late. If you want the certainty of receiving the souvenir T-shirt, don’t wait until the 30 of April to register! The souvenir T-shirts for this event will be ordered on the basis of orders received via our system of online registration. Therefore it is very important that you are careful to choose the correct size. Following is the table showing the exact dimensions of the sizes of the souvenir T-shirt. The souvenir T-shirts are ordered based on the precise number of orders received. It is possible to request a change of T-shirt by email within the date of 30 April. It will not be possible to change the size of your T-shirt after 30 April, nor will it be possible to request a different size when the race packs are being distributed.